Well what an absolutely abysmal time we had trapping moths last night. After having rained all day, the rain did let up at about 9pm but what we got instead were strong winds and then the rain returned at about 11pm. The vegetation was so saturated that it probably had a good deal to do with the lack of moths and species coming to light. Only good numbers of Flame Shoulder and Square-spot Rustic were recorded, the rest was just dross. 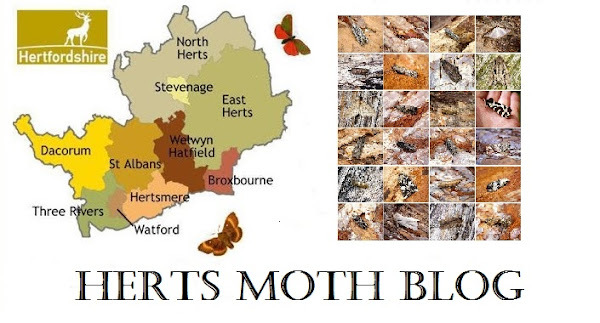 Still, we had a small gathering of hardy Herts moth group members and we congregated in one of the sheds and put the world to rights with deep conversation, sometimes veering off moth related topics. All good fun! Catch Report - 24/08/13 - Braughing Farmland - 1x 125w MV Robinson trap, 1x 160w MBT Trap and Actinic trap.